Chocolate cake that's easier than pie. NOTE: If this is an actual emergency, please scroll down past the text and head straight to the recipe. Life on the farm is defined by a never ending series of surprises. This, of course, is what makes it so interesting. Ever hopeful, I still write out an ambitious To Do List each morning, though most of the time it simply involves re-copying the previous day's list. This simply means that if we return home to find that Doll Face has her head stuck in the fence (again), an army of ravenous blister beetles has launched a full-scale attack on the garden, and there are four dogs on the porch instead of two, then it is time to grab a snack because dinner is going to be late. It also means that we get to eat and sleep before delving into the mystery of why the truck engine died six times on the way home. Often it is not possible to properly solve a problem right away. If, for instance, the tractor breaks down in a field half a mile from the house, you do the best you can with baling twine and chewing gum and hope you can sweet talk it back to the workshop where there are tools and manuals and a phone to order new parts. This scenario is the country equivalent of the first-aid kit versus the state-of-the-art robotic surgery wing at the hospital. A first-aid kit offers you the bare minimum: Band-Aids, perhaps some antibiotic cream or gauze, and a roll of that weird white tape that never sticks to anything. It's very basic, but it helps. And once in a while, you luck out and realize the first-aid kit was enough, and that the baling twine and chewing gum should hold things together for another couple of years. Sometimes the definition of what constitutes an actual emergency can be rather subjective. Most people would probably agree that a copperhead snake in the farmyard, a rainstorm in the kitchen, or pretty much anything involving blood all require immediate action. But I'm sure there are those who would not consider a desperate need for chocolate cake to be a dire situation. I disagree. Sometimes—especially if you have just dealt with the poisonous snake, the indoor rainstorm, and the blood—what you really, really need is a piece of chocolate cake. And absolutely nothing else will do. Producing a seven-layer, museum quality extravaganza complete with three types of filling and dusted with real gold is clearly not an option at this point. That would be the State of the Art Robotic Surgery Wing at the Hospital Cake. No, what you require is the First-Aid Kit Chocolate Cake: fast, easy, and immediately stops the cravings. Here is that cake. As you can see by the photo, this cake is not glamorous. It does not aspire to be a Gourmet magazine covercake. Of course you could dress it up in an endless number of ways, all to delightful effect. You could serve it with fresh raspberries and a dollop of vanilla whipped cream. Or with tiny scoops of cappuccino gelato sprinkled with crushed, chocolate-covered espresso beans. Or you could add things to the batter, such as mini chocolate chips, toasted nuts, instant espresso powder, finely grated orange peel, or a splash of good dark rum. All of these would be very nice. The point is, though, that you don't need to do any of them. The beauty of this cake is that it is absolutely delicious all by itself. It doesn't even need frosting. You bake it in a loaf pan and simply slice it into about eight thick pieces. 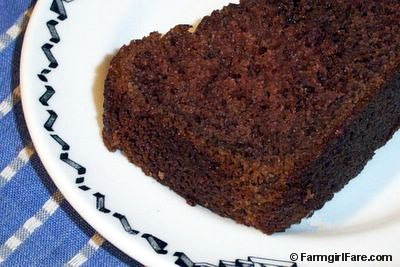 It's soft and light and moist and offers just the right amount of sweetness and chocolate. Yesterday it took me less than 20 minutes to go from empty kitchen counter to cake in the oven, and that included licking the beaters. You can even eat it warm. As with most cakes, this one tastes even better the next day. It also freezes beautifully and defrosts quickly. Just wrap each slice in plastic, toss them into a zipper freezer bag, and you will be prepared for anything. Since I am the only person in our household who suffers from Chocolate Cake Emergencies, I have never felt the need to double the recipe and make two loaves at once, but it would probably work just fine. Now, normally this is where I would put the recipe, but first I am going to divulge a little more about what went on during yesterday's test baking. I came across this cake recipe the other day and realized that I had forgotten all about it. (Actually, I think I may have hidden it on purpose, as I was making it a little too often.) I decided it needed to be shared and immediately came up with the perfect title for a post: Chocolate Cake Emergency. I just didn't realize how appropriate it would be. Here, then, is the "behind the scenes" part that usually gets edited out of the script. I think these excerpts from two e-mails I wrote to my friend Clare while the cake was baking pretty well describe what turned out to be a Chocolate Cake Emergency of an entirely different sort. The first e-mail abruptly ended with my saying, "Better go check cake. Smells awfully chocolatey all the way in here already." Four minutes later, I sent Clare another e-mail. The subject was "Oh Nooooooo!!!" and the message read: Burnt batter disaster in the kitchen! UGH! My own notes said 9"x5" or 8"x4" pan, so I decided to use smaller one since I had eaten so much cake batter. MISTAKE! Batter is oozing out all over the oven! Just pulled out another stick of butter to soften. Must try recipe again in larger pan. Dilemma is: do I let the chocolate volcano keep erupting or take it out now and eat it half raw? Maybe I should just go muck out the barn or brush Donkey Doodle Dandy or something. I left the cake in the oven, and it eventually stopped spewing batter everywhere. After plucking off the crunchy edges, the final result was deemed edible. I did, however, bake a second cake last night in a larger pan, and it came out perfect. If you don't have a 9"x5" pan (I love my Chicago Metallic commercial loaf pans, which are also great for baking sandwich breads), I suggest making a second tiny loaf or a few cupcakes or eating a whole lot of the batter (it's very tasty). As always, I urge you to use organic ingredients; they really do make a difference. Heat oven to 350 degrees. Grease and flour a 9"x5" loaf pan. Using an electric hand mixer, cream butter and sugar 1 to 2 minutes. Beat in eggs one at a time. Beat in vanilla. On medium low speed, add dry ingredients to creamed mixture (you can combine the dry ingredients first but I never do), alternating with yogurt. Beat just until smooth; do not over mix. Turn batter into prepared pan and bake 35 to 40 minutes, or until a toothpick stuck in the center comes out clean. Do not over bake. Cool in pan. Cake may settle in the middle as it cools—this is normal. For small but serious chocolate emergencies. What else can you do with this recipe? 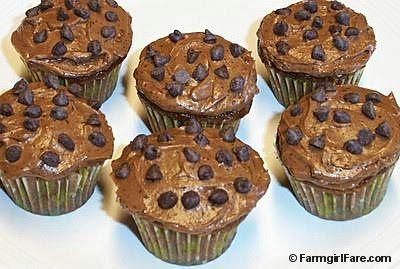 Make Chocolate Babycakes With Mocha Buttercream Frosting! © FarmgirlFare.com, the sweet toothed foodie farm blog where Farmgirl Susan shares recipes, stories, & photos from her crazy country life on 240 acres—and we sometimes eat chocolate cake for breakfast. oh I want some right now! That better be REAL soon, because I feel a chocolate cake emergency coming on right now! You'll just have to go get another one of those chocolate tarts to hold you over. Poor baby. Click on the "soon" link under the photo and read before you get mad at me. This is great news for me! Already I am finding out that others realize this can be a real and serious situation! Will get busy writing. Promise. Ah, so here's that famous chocolate cake. Mmmm. It looks as good as you described. I can wait, since you tell stories so well and I am sure there are going to be stories with this recipe!!! Love the morning mist photo beautiful. Mist and fog are my favorite things. That cake doesn't look very burnt to me. I actually like the burnt bits. Thanks! It is good! And so easy to make. Thank you. I, too, love mist and fog. So dreamy and ethereal. Chocolate cakes ... mm.mm. the picture looks so delicious. Yummy cake...will try the recipe. So who is Doll Face and why does she keep getting her head stuck? 4 dogs on the porch instead of 2...I would love that. And a poisionous snake? Yuck, the one animal that I a completely scared of. You will laugh...I am so scared of the garder snakes in my garden ! I run and scream like a little girl. It is pathetic. I always make the dogs check the area I am going to garden. I am glad I don't have poisionous snakes here. Chocolate cake looks fabulous. I'll be trying that soon. Since you mentioned blister beetles, could I ask how you deal with them? We have tomato plants in our backyard garden (in Kansas), and those nasty things wiped out an entire plant in one day! We had never heard of them before, but our extension office identified them, solving the mystery of what happened to the plant as well as my poor husband's leg. Yikes, those blisters are vicious. Any advice you have would be most appreciated! Welcome to the farm! Yep, there's nothing like a nice big piece of chocolate cake. You should make some! Yes, try the cake! And definitely let me know how it comes out. Doll Face is one of my very favorite sheep. She was born shortly after The Chippers in 1996. She is a triplet, and she and her sister Mary (the third lamb died at birth) each have twins nearly every year. Doll Face looks completely different than any of my other sheep. She has this long, narrow, unwooly (is that a word?) face. Well, she likes to push that narrow face through the small squares of woven wire fencing in the barnyard pen so she can reach green yummies on the other side. Unfortunately I guess her cheeks expand or something after eating, because she is not real good at pulling her head back out. Last year was the worst. The sheep were penned up while they were lambing (and while the first spring grass was given a chance to grow) and it seemed like every time I went down to the barn, there was Doll Face, standing with her head stuck through the darn fence. Now you can't just bend the wire a little and pull her out--she only pushes her neck further through the fence. If you go around to the other side, and try to push--doesn't work either. Once I got tired of cutting apart the fence with these giant cable snip things, I figured out that if you grabbed her back feet and lifted her off the ground, she would yank her head back through the fence in surprise. Nobody was injured during this process, but after a while she got pretty heavy with those twins inside her, and it was difficult to lift her up. Writing this out, the whole saga sounds a little odd. Anyway, fortunately this year the timing with the lambs was different, and I think she only had her head stuck in the fence once. It helped that I had gone around double fencing most of the entire pen (thus making the wire squares smaller), but she was really good at finding the gaps I'd skipped. It's a good thing I love her so much! She about drove me insane last year. Poisonous snakes? Yep, we have quite a few of them here, especially copperheads. Knock on wood, I've only seen one or two this summer, but sometimes it seems like they are everywhere you turn. Boots are a necessity when walking through any field, and at the beginning of each snake season I usually do not remember this important fact until I am several hundred yards out in a field looking for a sheep or something--without my boots on. The good thing is they hibernate during the winter, so at least it's not a year-round worry. A copperhead bite will not kill a person, but a bite to something under 35 pounds (like a cat or small dog or baby lamb) is often fatal. It's great that the dogs will sniff out snakes for you! Ours do that too. Robin is a real ace at it. Welcome to the farm! I have blister beetle information for you, but I am going to publish this before it vanishes. Will write more to you soon. I'm baaaack. I was so sorry to hear about your blister beetle invasion. You're right; they are vicious--and ravenous. They can destroy your entire garden in a couple of days. For those fortunate readers who are not familiar with blister beetles, here is a little background information on them, taken from one of my very favorite books, Organic Plant Protection, published by Rodale Press. "The black blister beetle, also known as the Yankee bug and just plain "blister beetle". . . is a fairly long (up to 3/4") and slender beetle, with soft, flexible wing covers. The entire body is black or dark gray, and the covers may be marked with white stripes or margins. Another species, the margined blister beetle, is distinguished by a narrow gray or yellow margin on the covers. Blister beetles are very active, and frequently appear in large numbers in the latter part of June and through July. "Handpicking is effective in controlling this pest, but you should protect your hands with gloves, as the beetles discharge a caustic fluid that is harmful to the skin. Some growers achieve control by dusting with equal parts lime and flour. This should be done at the warmest time of the day. "Blister beetles are usually found in swarms or colonies feeding on the blossoms and foliage of any of a number of garden and field crops--vegetables, vines, trees, and flowers." We have both species mentioned here--the black/grey and the lighter ones. Last year both were out in force, and it was terrible. What they don't completely devour, they ruin with their icky black droppings. I didn't know about that lime/flour solution until reading it just now. It sounds interesting. I would start with that as it is very safe. Look for lime at a feed/farm supply store or nursery or garden center--it is very inexpensive. Last year I ordered some Liquid Rotenone-Pyrethrins Concentrated Spray from Gardens Alive. They are a great company that sells all kinds of natural fertilizers, insecticides, etc. They also have a mail order catalog available. Rotenone is natural, but it is pretty strong stuff--usually a last resort option for organic growers. You might also check their catalog or website for other products that kill blister beetles. I bought it after the blister beetle invasion, and fortunately this year they haven't been nearly as bad, so I haven't actually tried it yet. It is also good for all kinds of other pests, too. I have read various other "folk tale" remedies--like that they won't cross wide, empty spaces so you should either leave wide rows between plantings or once they have invaded, clear out the surrounding weeds, grass, plants, etc. I've even read about people yelling at them to scare them away. Who knows! When I'm desperate, I'll try some pretty crazy sounding things myself! I've never gone the hand-picking route, as there were always way too many of them--hundreds and hundreds last year. They also run fast! But that would be your best bet if you only have a few to contend with. Thank you kindly for the information! Those terrors seem to be gone for now, but we'll know what to do next time. We thought we had gotten rid of them once, but they showed up a second time. It's good to know some natural remedies to try. Much appreciated! Oh, my god. I had no idea that anyone else had chocolate cake emergencies (although now that I think of it, it seems stupid of me to have assumed I was the only one). I found your blog through Eggbeater, and boy am I glad I did! I'm copying down the recipe now so I'll be ready next time an emergency... well, emerges. Welcome to the farm! And to the Chocolate Cake Emergency Club! I'm so glad you found us. And just remember--you are not alone (as you can see by the other members' comments). Though you might want to be once you have one of these chocolate cakes in front of you. : ) Enjoy! if I have a choc emergency, I will make this batter, put half as much in each muffin tin, bake them and when they are cool-put fresh whipped cream on top! Then, I might sprinkle some choc chips or rainbow sprinkles or even M&M's! Hi! I am new to your site this week. I've tried your spinach soup receipe and the chocolate cake emergency. Both were terrific. My cake fell in the middle but that's probably because I opened the oven door early on. opps! It's still delicious! I finally had a chocolate emergency, here on Valentine's day. It was amazing. Sift together 1 1/2 cups flour, 1/4 cup cocoa, 1 tsp baking soda, 1 cup sugar and 1/2 tsp salt. Make a large, a medium, and a small hole in the pile of ingredients, and pour into them, respectively: 5 Tbsp oil, 1 Tbsp vinegar and 1 tsp vanilla. Then pour a cup of cold water (or cold coffee, if you have it) over it all and mix it until it's mixed. Pour it into a greased 9 x 9 x 2" pan and bake it at 350 F for 30 minutes while you resume CPR. My cakes are baked (thanks for the warning about them sinking in the middle - I was a little worried). I'm planning on serving them for dessert with fresh raspberries and freshly, but softly, whiped cream, maybe a grating of chocolate over all. Great recipe for life's emergencies...made it and it was very good. Love your recipes. Hi Susan! I have to tell you that I've been enjoying your blog immensely! It's gotten me baking again (which I really love to do.) I've made this cake a few times now, and love the recipe. This time I added about a cup, or so, of frozen raspberries to the batter. Heaven. Even though I am reading this 5 years after you wrote it, I laughed at the "emergency" post. 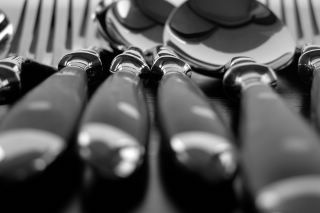 I have been reading your blog off and on for the past couple years and this passage reminded me of when I baked and catered while my children were younger. I used to bake potato rolls every day for a restaurant so I would wake up and start at 3:30am for the head chef's pick up at 8:00am. That progressed into designer cinnamon rolls, strudels and then baked goods for a tea shop and ultimately catering large events such as weddings. Many of my emergencies became new inventions.... It brought back fond memories. I am definitely going to try this chocolate cake tonight as it is starting to feel like a "chocolate emergency"
Love it here, sure wish I never left Missouri and envy your wisdom. I also am a california/West Coast girl who moved to MO, but ended up on a ranch in Wyoming about 5 years ago, I sure wish I hadn't done that. Can I sub buttermilk for the sour cream/yogurt? I'm sure buttermilk would probably work, but since it's not nearly as thick as yogurt or sour cream, you might want to use a little less. I enjoyed reading this post very much! Realized we finally made it to 2012! I love your blog about farm life and it definitely takes me back to my grandmother's little farm when I was a child (a hundred yrs ago!). Chocolate is my most favorite food group in the entire world and I think I heard the weather man say there is a chance of a chocolate emergency on tomorrow's horizon! Thanks to you, I will be prepared! I love this recipe so much and make it a lot! It does have a lot of fat in it, so I've found that by adding an additional 2 T. of flour, the middle does not sink. I guess it provides a bit more structure. Not that the sinking matters, but I have found this works to make it look very pretty and yummy.